It appears that two of Strikeforce’s top welterweights will square off at the promotion’s upcoming August 18th event in San Diego, California, as Tarec Saffiedine will reportedly fight Roger Bowling at the upcoming card. The event is scheduled to be hosted by the city’s Valley View Casino Center. 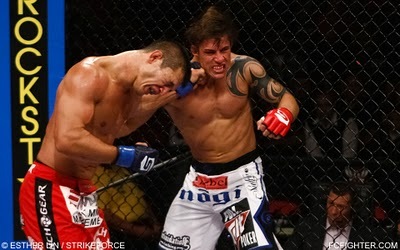 Strikeforce hasn’t made any official announcement about the fight, which was reported by MMA Junkie today. Bowling (11-2) is coming off back-to-back stoppage wins over Jerod Peoples and more recently Brandon Saling, after losing by TKO to Bobby Voelker last July. The 29 year-old-fighter is 3-2 in his last five fights, with both losses during that stretch coming against Voelker, who Bowling defeated by technical unanimous decision in May, 2010. Saffiedine (12-3) has scored decision wins over Scott Smith and most recently Tyler Stinson, after losing by UD to Tyron Woodley in January, 2011. The Team Quest fighter is 4-1 in his last five outings. The August 18th Strikeforce card is expected to feature a bantamweight bout between champion Ronda Rousey and former champ Sarah Kaufman in the main event.